Use TB2QA9G to reference this item. The goal of this coin is to spread the message of Bike Awareness, while travelling from cache to cache. While this coin is travelling with you, take some time to think of the things that you can do to improve safety on the roads. Please write them in your logs. Let others enjoy read the message of this geocoin too. Riders face more hazards then drivers, PLEASE give them more room!!! Riding safely takes everyone’s cooperation and patience. It's a painful fact that motorcycle riders are 30 times more likely to be killed in a crash than any other vehicle drivers. *** Rolling stops kill! *** driving and riding responsible helps save lives! *** Respect those around you, watch for all users of the road! *** Stop driving distracted, look for bikes! *** Bikes have every right a car does, please share the road! 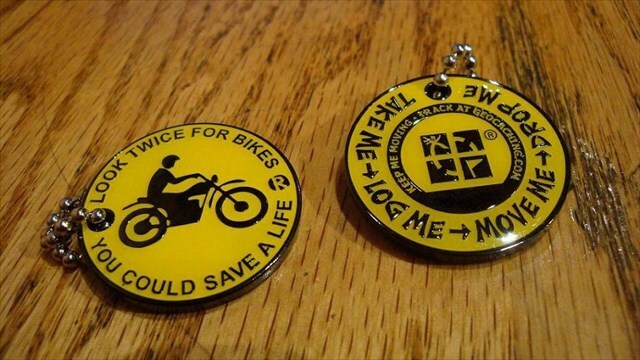 *** Look twice for Bikes, you could save a Life! and Riders face more hazards then drivers, PLEASE give us more room! Left one, picked one up. will move it along soon.